We aren’t the type of people to give you unsolicited advice, but we will advise you to give this beer a try. Unsolicited Advice is the next release in our hazy IPA series. Council is THANKFUL for all of our friends that we have made in our brewery and Tasting Room. And to celebrate, we are throwing a FRIENDSGIVING Potluck on November 26th from 6-8pm. Sit back, relax, and add to cart! On Cyber Monday (November 26th), check out our online store inventory of bottles and cans we are offering at 20% off when you purchase (6) or more 4-Packs or Bottles (mix and match. Support East County local businesses and get unique gifts for your loved ones. Come do your shopping at Council Brewing in Santee on Saturday, November 24th 12-4pm. Grab a beer in the tasting room and browse several pop up shops in our brewery area. Get your holiday shopping done early, while enjoying a pint in the Tasting Room! We’ve got Black Friday Specials for the beer lover in your life. 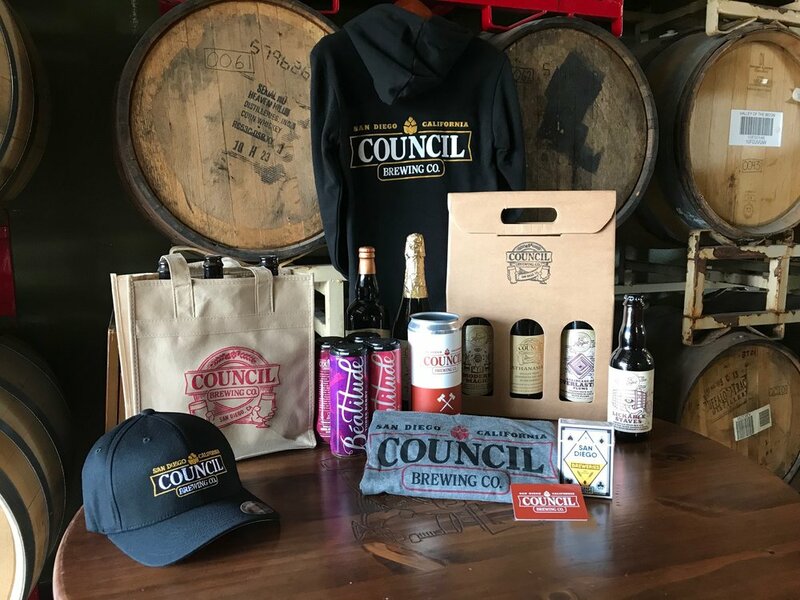 Pick up rare bottles, 4-packs, and Council Apparel at a discount! >> 20% Off When You Purchase (6) To Go Beer Items (4-Packs or Bottles) or More. >>Crowler Gift Pack - includes a brewery deck of cards, crowler fill gift card, T-Shirt all conveniently packaged in a crowler can. We know SDBW has been a little rough on your pocket books, so we are thanking you for your support with a Customer Appreciation Party. Enjoy $5 pints all day on Saturday, Nov. 10th at both tasting rooms (Kearny Mesa & Santee)! On Thursday, Nov. 8th, we are giving a behind the scenes look at our second brewing facility in Santee, where we package our IPAs and clean barrel-aged beers. If you would like to check it out, meet in the Tasting Room on the hour at 4pm and 5pm. Tasting Room Manager, Kristina Blake will be giving the tours! We’ve reserved them, cellared them, and now we are re-releasing them for you in our SDBW Archive Bottle Sale. Liz has pulled (4) different combinations of Magic Factory bottle releases from the Council reserves and thoughtfully paired them together for a great assortment of sours. Are you interested in learning more about creating complex, balanced, and flavorful beers? Come learn the art of blending at our San Diego Beer Week edition of Beer Education Night with presenter, Jeff Crane (Barrel Program Director). On Tuesday, Nov. 6th, come see where all the magic happens with guided tours of our Kearny Mesa Brewery and Magic Factory. Currently closed to the public, we are giving a behind the scenes look at our second facility, where we ferment and package our sour and barrel-aged beers. With a robust barrel program including over 100 oak barrels and 3 oak foeders, it's no secret that we love wild, sour, and oak aged beers here at Council Brewing. Therefore, it’s only fitting that we highlight these beers in a special event during SDBW! As part of San Diego Beer Week celebrations, we are pairing two of East County favorites-BEER & DONUTS! Enjoy a flight of (3) mini Mary's Donuts and (3) 4oz pours of Council Beers. Have you ever wondered what could possibly make beer better? How about ice cream?! Stop by either Council Brewing Tasting Room (Kearny Mesa or Santee) on Sunday, Nov. 4 from 12-8pm for a beer float. We are bringing back one of our most popular SDBW events on Saturday, Nov. 3rd. IPA Day features the release of our annual SDBW Triple IPA, Bad Advice and a special flight of five different IPA’s. Beatitude, Fruited Sour Ale (5.0% ABV) will soon be available in 12oz sleek cans and sold individually or build your own mix 4 pack! Our first Beatitude can release includes four Beatitude variants; Guava, Three Berry, Raspberry, and Cherry. International Stout Day is a worldwide celebration of the iconic beer style, Stout. On Nov. 1st, Council Brewing will be celebrating with our flagship Imperial Oatmeal Stout, Pirate’s Breakfast. We are tapping a special keg of 2016 Bourbon Barrel Aged Pirate’s Breakfast with Mostra Coffee & Vanilla at both tasting rooms (Kearny Mesa and Santee). Join us Wednesday, October 10th at 7pm for our Beer Education Night, where we dive into the wonder of brewing and enjoying sour and wild beers. The talk will cover the main microorganisms (yeast/bacteria) that produce the unique flavors these beers, dissect several of the Magic Factory sours we have on tap, and wrap up with brewing tips to help you make the best sour/wild beer at home. San Diego is a city of endless summers and Day Drinking IPA is the ideal beer to enjoy our beautiful Southern California climate. This easy drinking Brut IPA is dry-hopped with Mosaic and Mandarina Bavaria hops and has a super dry finish. We are proud to be hosting our Fall Beer Dinner in the Tasting Room on Sunday, October 7th at 4:30pm. Once again, we are headed to the Council archive to find our favorite oak aged and specialty beers to highlight in this six-course meal. Let's earn our beer by sweating with Joe Craig from East County Crossfit, as he leads a BrewFit workout incorporating exercises such as grain bag carries, keg walks, keg swings and more! Your 2017 San Diego International Beer Competition Best of Show Winner is back! Our first batch of Lickable Staves sold out quickly, but we had to give this beer plenty of time to develop and achieve our targeted flavor profile: freshly baked cherry pie! Lickable Staves is finally ready for release and we can’t wait to debut our new 375 ml bottles. Purchase bottles of Lickable Staves online (store.councilbrew.com) or in either tasting room starting Friday, October 5th at 11am. Draft pours will also be available to celebrate the release of our big winner! San Diegans are all about Brunch Life & Hazy IPA’s, so we combined the best of both worlds for our latest can release, Weekend Brunch Hazy IPA. 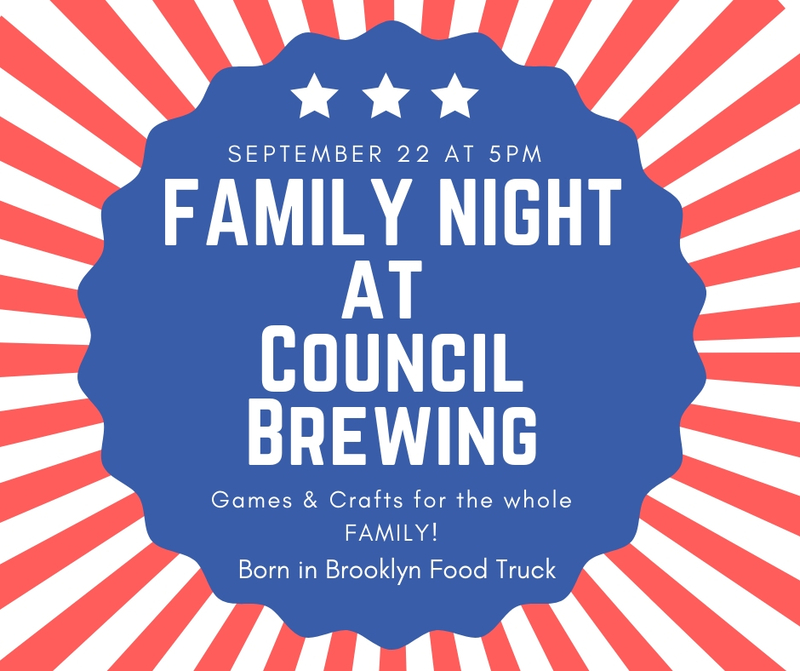 Bring the whole family out on Saturday September 22 for a fun Family Night at Council Brewing in Santee. Come play board games and enjoy Born in Brooklyn Food Truck for dinner. We have some great beer for the adults to enjoy too! On Friday, September 21st, enter through the “Magicdor” and experience the mystical creation of a collaboration between Council Brewing and Cellador Ales. Ahoy, matey! September is just around the corner and that means it’s time for our annual Talk Like a Pirate Day! On Wednesday, September 19th from 2pm to 9pm, we invite all of you Scallywags to join us in either of our Tasting Rooms for a party celebrating one of our flagship beers, Pirate’s Breakfast Imperial Oatmeal Stout. What could be lurking in the murk? Perhaps it's an amphibious fish god? Or is it the creature from the black lagoon? 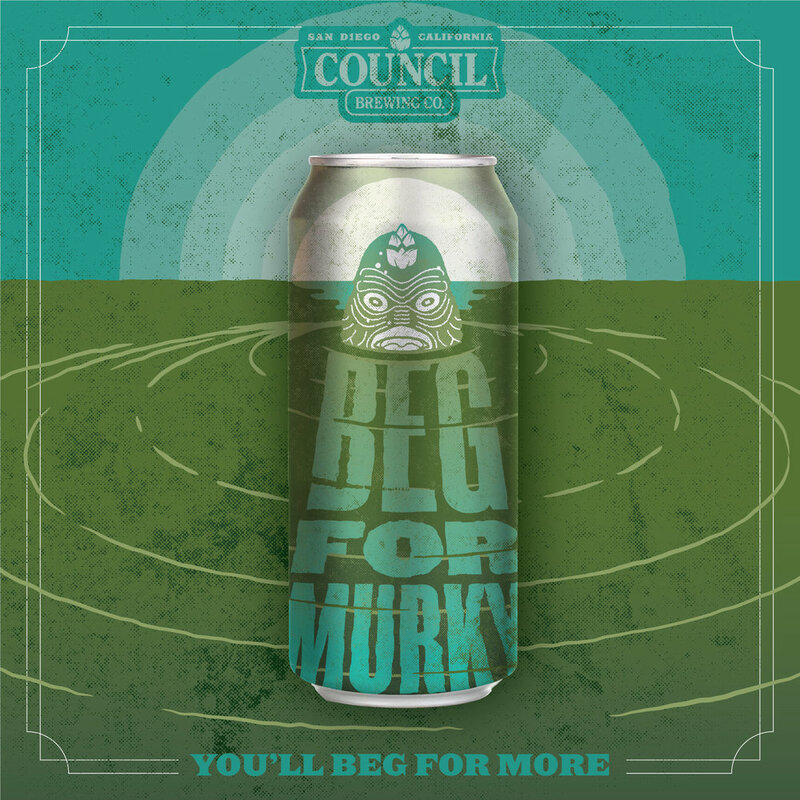 Find out on September 6th for the release party of Beg for Murky, Hazy Imperial IPA. This silky smooth juicy IPA was double dry hopped with Citra and Hallertau Blanc hops providing an extra hop punch in the aroma and flavor. We will have cans and draft available at both tasting rooms from 2pm-10pm on release day. BrewFit is returning to Kearny Mesa on September 1st and Joe Craig is back to lead it! Come get your sweat on Labor Day Weekend doing brewery themed workouts, like grain bag carries, keg walks, keg swings and more! Cost is $15, but if you bring a friend, you'll save $5 ($25 total - online or at the door).